If you’ve been working with SAP for at least 10 years, then be prepared to make the annual trek to Las Vegas each year for the next couple of years. In his keynote speech to the conference attendees, Bjorn Goerke (Executive Vice President, SAP) championed a spirit of innovation to address the challenges of the business landscape of the future. The dramatic entrance in a tricked-out DeLorean and the Back To The Future theme helped to set the stage and frame the discussion. It was something to see up close. As an aside (and not nearly as dramatic as Bjorn’s keynote), we were very proud of our vendor booth at TechEd. 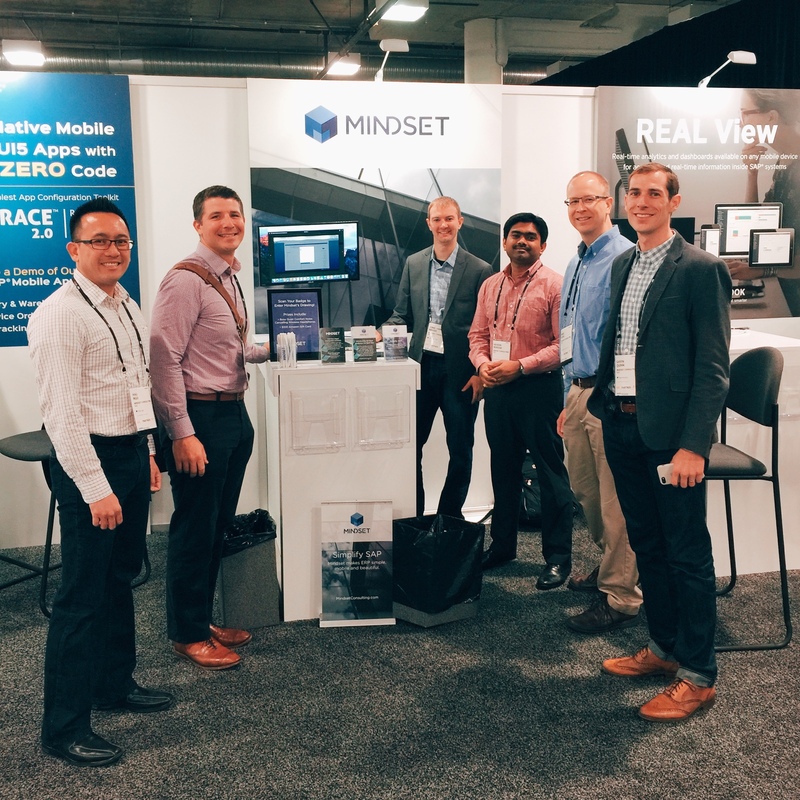 Here are a few of us ready to geek out about our SAP certified app Mindset Analytics for Fiori. Getting back to the subject of innovation, this year’s conference was remarkably fast-paced. From the recently announced BW/4HANA to product roadmaps for all-things-SAP HANA to the hands-on S/4HANA embedded analytics workshops, there was a metric-ton of information to absorb. As a seasoned TechEd attendee, I was amazed at how quickly SAP is changing their development tools (as they should be). Having worked with BW for the better part of 15 years, I’ve experienced the growing pains as BW progressed from the 3.0, 3.1, 3.5, to the various 7.x versions. With BW/4HANA (building on the development knowledge of S/4HANA), SAP is changing their flagship product to address new challenges of the digital age. After 5 days and 40+ hours attending lectures, working through hands-on workshops, and speaking to fellow practitioners, I am exhausted and excited at the same time. SAP planted their flag and declared that their Enterprise Data warehouse is a new solution (and not just another 7.x iteration). Karl Kessler mentioned the new codebase in his July 2015 article A Foundation For The Future but that didn’t stop customers and vendors from asking “Is BW Dead”? BW/4HANA is a new product; designed from the ground up to address new challenges such as Big Data, The Internet Of Things, and In-Memory computing. How does this affect you (or your fellow BW Developers)? RSA1 Admin Workbench is gone. That’s right. The comforting and familiar development screen that you’ve been accustomed to during the course of your career does not exist in BW/4HANA. In earlier versions of BW 7.5 –like the one we were using in the hands-on workshop session DMM 265 – SAP HANA Data Warehousing: Simplified Modeling with SAP BW 7.5 SP4, the familiar SAPGui would appear when creating and maintaining transformation rules. Even then, SAPGui was visually jarring after we had been building our models via the Data Flow Modeler in Eclipse. Data modeling and query designer is feature complete in BW/4HANA. If you’re not already building composite providers or advanced DSO(s) in BW on HANA (7.4), I would urge my fellow Classic BW developers to quickly get up to speed on the new interface and approach. The combination of BW/4HANA and S/4HANA is where SAP analytics really shine. No longer do you need to chose (or explain to your business users the difference) between strategic reporting with historical information or real-time reporting with operational data. Gone are the days where you as developer would need to disappear for weeks at a time to build that ALV Grid report in ECC. The speed at which you can declare and consume information (via a CDS View for instance) is very much welcomed. The unnecessary housekeeping activities of declaring in SE38 the selection parameters, table joins, output layout, etc. are essentially eliminated with CDS views. What’s more exciting is how easily the new KPIs built in S/4HANA can be extended to Fiori. When you consider how fast technology is changing the way we work, you may want to rethink your ability to adapt. In previous conferences, for example, I was content to pick a couple of interesting lectures and perhaps one promising workshop. SAP was not exactly innovating in the past decade and being positioned as a BW Architect with an ABAP programming background was more than enough to find interesting work. Bigger challenges are coming so the development landscape has changed. For this year’s conference, I triple booked (or more) each time slot because some lectures have more value than others. You just can’t tell from the abstract alone. I also attended 3 hands-on workshops (instead of the the 2 that each attendee are allowed to reserve). Expert tip: There is plenty of room in these sessions towards the end of the week. This year, I also plan to watch missed sessions online at TechEd Live. There is so much content in the first two days that it is impossible to choose between conflicting sessions and workshops. So will I be going next year? In 2001 when I started my SAP career, there were ABAP and BW as the main reporting solutions. In 2016, I’m retooling myself with embedded analytics in S/4HANA, extending business content reporting in Fiori, agile modeling and development in BW/4HANA, dash-boarding in Design Studio, and self-service reporting in Lumira. Between the new tools like SAP HANA Express edition and the tidal wave of content that is available in the OpenSAP courses, it’s helpful to connect with fellow practitioners and share your thoughts and experiences. SAP TechEd is proving to be a great resource for that purpose. I can’t wait until next year. P.S. I’m super curious to hear your insight. What was your one big take-away from this year’s TechEd?